Felicia van Bork has several interrelated bodies of work. For the How To series, she creates collages by piecing together torn and cut pieces of her own monotype prints. This body of landscape-based images allegorizes a journey through the (social) environment. The Color Grids comprise a growing body of work consisting of drawings, paintings, and video. Born in Toronto, Canada, Felicia completed her undergraduate studies at the Ontario College of Art and Design University and earned her MFA at the Massachusetts College of Art and Design at the Fine Arts Work Center, Provincetown, MA. 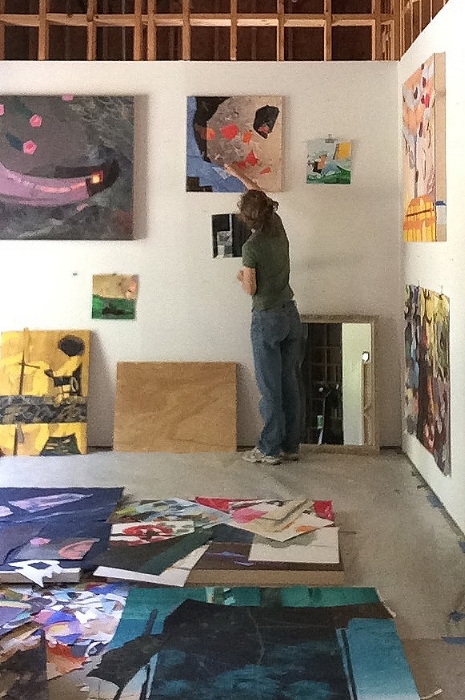 The artist's paintings and collages are widely collected in the United States and Canada and Felicia has been the recipient of numerous residency fellowships, including from the Virginia Center for the Creative Arts and McColl Center for Art + Innovation, where she manages the printmaking studio. In the summer of 2017, she was a Visiting Artist at the American Academy in Rome. Felicia’s collage, How to Mine the Past is in the permanent collection of the Mint Museum of Art, Charlotte, NC. Her work is widely collected in the United States and Canada.